This past weekend, Beyond the Bomb and its supporters made their message clear. Women (and the people who love them) across all communities, origins, and sectors have had enough. Our broken nuclear system cannot keep playing games with humanity’s future. Over this past weekend that honored the legacy of Dr. Martin Luther King Jr., the third annual Women’s March took to the streets of Washington DC along with hundreds of sister marches throughout the country and world. Beyond the Bomb is proud to have been the first anti-nuclear advocacy organization to have officially partnered with the 2019 Women’s March. 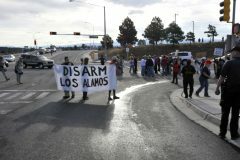 In coordination with the movement’s message of resistance in the tradition of Dr. King’s civil rights work, the anti-nuclear war contingent honored his public efforts of peace and anti-militarism. Joined by our partners at Win Without War, Physicians for Social Responsibility, Women’s Action For New Direction, and the Arms Control Association, the contingent marched to demand urgent changes be made to our broken nuclear system. A catastrophic nuclear failure would disproportionately affect those already most vulnerable – women living in poverty, indigenous peoples, and communities of color. The presence of the anti-nuclear contingent was a declaration that the fight against nuclear violence and injustice has, and continues to be, a highly intersectional issue. Not only have those impacted by nuclear mining, weapons production, and testing yet to receive adequate reparations for years of pain and injustice; they continue to be victimized and, like all of us, must live under the unceasing threat of nuclear violence. Today, the Bulletin of the Atomic Scientists released their newest statement on the Doomsday Clock, a metaphorical accounting of our proximity to a man-made global catastrophe. At 2 minutes to midnight, we are in the midst of the most poignant existential threat since the height of the Cold War. The anti-nuclear war contingent at the Women’s March stood in solidarity to demonstrate our unequivocal demand for bold action from our elected officials. It is time for them to exhibit global leadership in the fight for a nuclear-free world. We demand the implementation of policies, such as No First Use, to put guardrails on our nuclear system and ensure our security is not tied to the whims of the resident at 1600 Pennsylvania Avenue. Over the course of the next two years, the 24 federal policy initiatives defined by the agenda will include ending state violence, immigrant rights, environmental justice, and disability rights, among others. To further prioritize and organize, three overarching principles have been developed: universal healthcare/medicare for all, equal rights amendment to the constitution, and ending war. 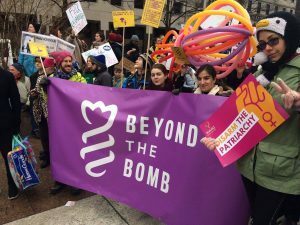 Beyond the Bomb is proud to announce that the Women’s March confirmed that “non-proliferation will be a priority,” as we work together to achieve these shared principles. In turn, Beyond the Bomb is committed to working with the Women’s March in the years ahead and excited to be there every step of the way. We demand the implementation of policies, such as No First Use, to put guardrails on our nuclear system and ensure our security is not tied to the whims of the resident at 1600 Pennsylvania Avenue.